Amazon Web Services and Lockheed Martin have agreed to combine their technology platforms to provide clients the capability to download and upload satellite data and commands. 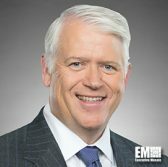 Lockheed will integrate its Verge antenna network with the AWS Ground Station to help users quickly download, analyze and process satellite data amid weather disturbances and other unplanned outages, the companies said in a joint release Tuesday. “Our collaboration with AWS allows us to deliver robust ground communications that will unlock new benefits for environmental research, scientific studies, security operations, and real-time news media,” Ambrose added. Government clients can directly access satellite data received through Lockheed’s Verge network in their virtual private cloud platforms in AWS Secret and GovCloud regions. “The integration of AWS Ground Station with Lockheed Martin Verge brings the unique capabilities of both companies to mutual customers, enabling them to control satellites across both networks and downlink data faster with more resiliency,” said Teresa Carlson, VP of worldwide public sector at AWS.